It seems like there are thousands of signs advertising "The Thing? What Is It?" for a hundred miles in all directions from Willcox, AZ. This was great advertising for years. How could you resist the pleas from your kids to stop, pay a buck, and see "The Thing?". Unfortunately or fortunately, depending on your point of view, the Internet has made it possible to find the answer without having to stop. Mavis Googled it this morning and learned more than she wanted to know. I'll leave it up to the reader to Google it yourself so we won't spoil the mystery if you want to see it in person. Today was the day for rain and snow. 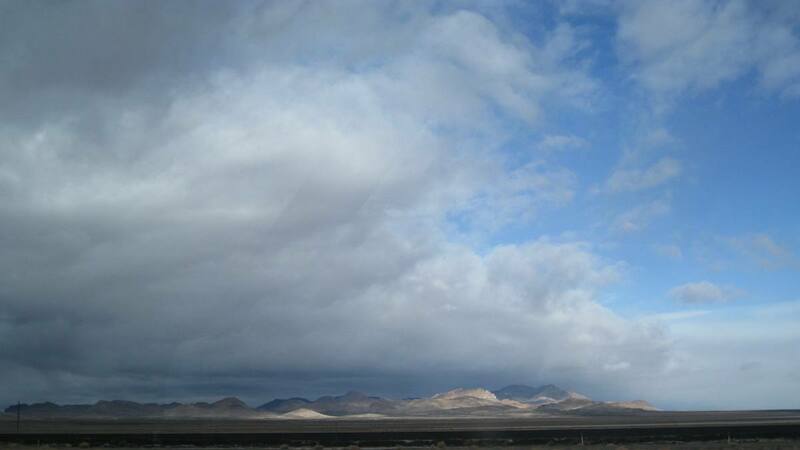 The big sky was spectacular leaving Deming with broken clouds. We got lots of rain and arrived at noon at Gilbert Ray County Park, near Tucson beside the Saguaro National Park. This one of the best campsites in the country. It has mountain views and tall cactus all around our site. We'll stay here for 3 nights, visit Old Tucson Studios, go shopping, wash the salt off the View and take it easy.